There are so many dj's out there - how do you know who will be the right fit for you? I live in San Francisco and don't have the time to get to Tahoe in the next month or so to meet with any of them - does anyone have any recommendations? The Reno Tahoe DJ Company - http://www.renodj.com The owners name is Larry Williams. His website is fabulous. He really puts the personal touch on everything. With his new standard wedding package we'll be able to use his services. We have a really small venue, but wanted a more professional touch. He's also in touch with all the coordinators too. Good Luck. I would reccomend him to anyone. Yes he was. We had a morning wedding so I was worried about people not getting up and dancing, but we had a packed dance floor:) We pretty much told him two songs we wanted to hear and let him take over and it was great. I used JJ Entertainment. Our dance floor was packed the entire night. They did the music/sound for our outdoor wedding ceremony, outdoor cocktail hour, and indoor dinner/reception. They (Suzanne and Gary) were incredibly accomodating (we moved our toasts outside at the last second). I never met them in person until the day of the wedding. We spoke on the phone several times and I filled out a very long sheet of "songs to play" and "songs to definitely not play". They did a great job and I highly recommend them. 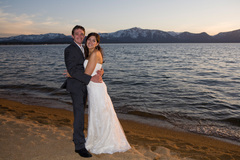 It seems like JJ Entertainment and Bill Burns are the most highly recommended in Tahoe - I need to make a decision soon! They both have incredible reputations in town as talented and fun. They're on most/all of the local recommended vendor lists. I know both personally and they're personable & fun. Ryan (Lake Tahoe DJ) is DJing our wedding, and Derek was also on our the list but was already booked.